Full featured camera back system (Anton Bauer or V Mount) transceives 4K Quadlink or 3G-SDI video, ClearCom or RTS Intercom, remote camera control, genlock and tally. Includes 1RU base unit and fiber camera back with premium quality TFS Magnum or dual LC fiber for connection to optional patch panel. Provides same functionality and performance as MultiDyne or Telecast systems at 1/2 the price! .... a truly value proposition!! Compatible with TFS DuraTAC steel armored tactical fiber cables terminated with premium quality TFS Magnum connectors. Available in lengths of 500 to 2,000 feet or use TFS inline cable couplers for virtually unlimited distances! Full featured camera back system (Anton Bauer or V Mount) transceives 4K Quadlink or 3G-SDI video, ClearCom or RTS Intercom, remote camera control, genlock and tally. Built-in power supply and DC/DC converter provides SMPTE cable power for the Shotgun fiber back and your camera! Includes 1RU base unit and fiber camera back with your choice of TFS Magnum hybrid connectors or dual LC and power connectors for connection to optional patch panel. Provides same functionality and performance as MultiDyne or Telecast systems at 1/2 the price! .... a truly value proposition!! 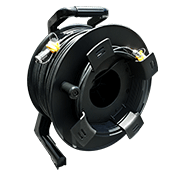 Suggested SMPTE hybrid fiber cables: 500, 750 or 1,000 foot reels of premium quality TFS DuraTAC armored SMPTE tactical fiber cables terminated with TFS Magnum Hybrid connectors.